Article produced for the New Zealand Buddhist Council in April 2018, by Sally McAra and Clare Woodham. Our first featured Buddhist organisation was Namkook temple, which serves the Korean Buddhist community in the Auckland region. Let’s now look at an organisation in central Napier, which serves people who are often new to Buddhism. The group is called Phuntsok Choeling Hawkes Bay Buddhist Centre. 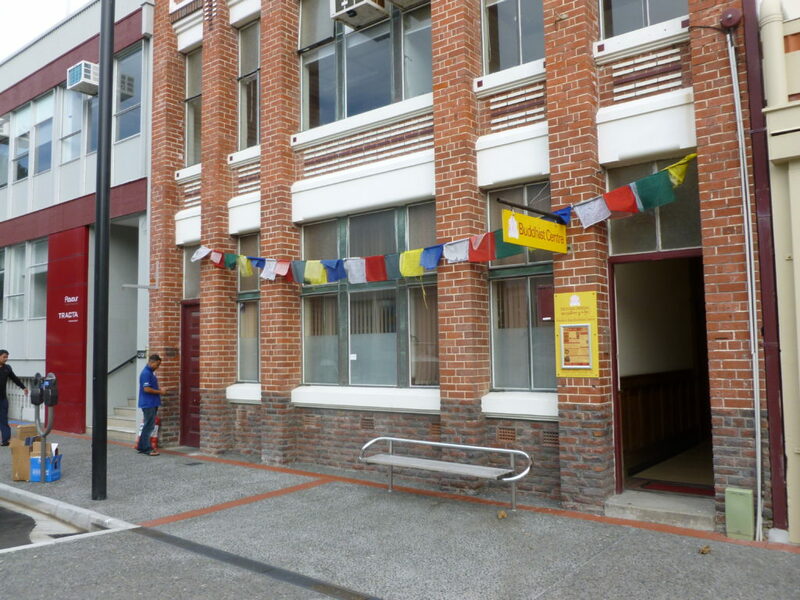 Also known as Palpung Kagyu Samten Choling Tibetan Buddhist Centre, this Napier-based organisation was founded in 2006. Clare Woodham, a trustee, tells me that the core group consists mostly of middle-aged and older people, more female than male. The regulars are generally Pākehā New Zealanders or more generally people of European ancestry, rather than people from countries where Buddhism is part of the received cultural tradition. However, she says, their eight-week meditation courses attract some younger men and women. The diversity of the wider community (in terms of cultural background, ethnicity and gender) is seen in some of the centre’s activities, for instance in an annual introduction to meditation at the local polytechnic, for which participants are mostly Māori and Pasifika. Most Māori who visit or attend Phuntsok Choeling’s events come from an Armed Services background and have spent time in Singapore, and they have often had at least a brief exposure to Buddhism there. Residents from the local addiction recovery centre attend the Wednesday night meditation session, and most of these people are under thirty or so years old, and generally around a third are Māori. Clare hopes that Phuntsok Choeling will become more widely known as a centre for Dharma, peace studies and practice. She hopes it will continue to grow its community profile through peace walks, tree planting, and Dharma activities in public places.